Textual is the world’s most popular application for interacting with Internet Relay Chat (IRC) chatrooms on OS X. 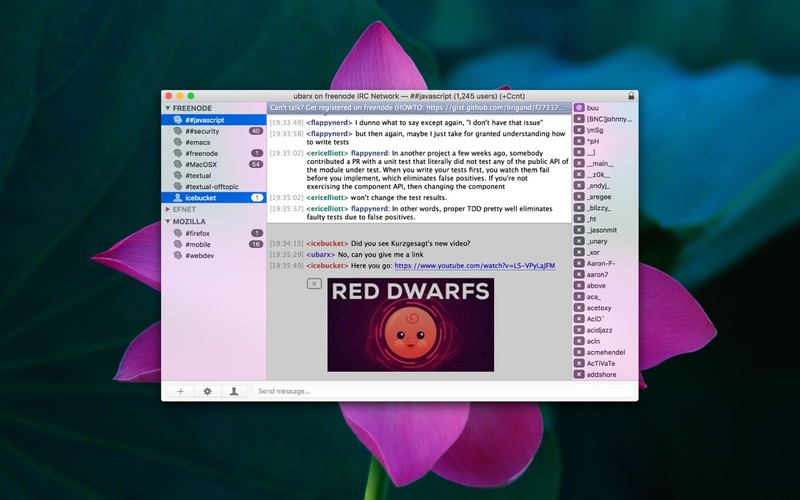 First appearing in 2010, Textual has since evolved and matured into the top IRC client for OS X; relied on and trusted by thousands of people. • Textual includes two elegantly designed dark and light variants of the user interface which have been refined all the way down to the very last pixel. • Textual supports very powerful modern technologies such as native IPv6, the latest IRCv3 specifications, client-side certificate authentication, and much, much more in an easy to navigate, clutter free environment. • Textual protects your privacy by leveraging widely accepted, proven technologies such as Off-the-Record Messaging (OTR) to ensure that the only people reading your conversations are those that you intend to. • Textual takes customization to the next level with styles created using well documented, open web standards in addition to addons built using a multitude of programming languages such as AppleScript, Objective-C, PHP, Python, Perl, Ruby, Shell, and Swift. Added inline video support for public Nest camera clips. Added setqueryname command which can be used to rename query windows. Added preference beneath "Only inline images and videos" in the Inline Media section of Preferences that when disabled, disables embeddable video services such as Vimeo, YouTube, and others. Added "Enable Off-the-Record Messaging" preference to the Off-the-Record Messaging section of Preferences which can be used to disable Off-the-Record Messaging support. The timer command has been rewritten from scratch. The new command supports repeating timers. It also supports listing, stopping, and restarting timers. Type "/timer help" for more information. The lagcheck and mylag commands now outputs time in milliseconds. The correct syntax for many commands is now shown when a command is used incorrectly. Query windows are no longer renamed during nickname changes if one is already opened for the new nickname. "Begin Session" no longer appears in log files unless at least one item is logged during the session. Support for echo-message has been disabled until message-tags is more widely supported. The per-channel preferences labeled "Show inline media" and "Disable inline media" are now saved internally as separate flags. When the global preference to show media inline with chat is toggled, the per-channel preferences no longer behave as an inverse of the user's intent. Fixed main window segmented controller appearing clipped on the right side. Fixed app becoming unresponsive when displaying certain prompts together. See textualapp.com/changes for history of changes.